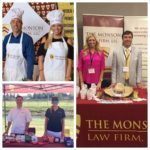 The Monson Law Firm would like to wish Ann’Lee Earles Inman the best of luck as she leaves us to return back into Real Estate full-time. Ann’Lee has done an amazing job for us the past 3 years as our Marketing Director, helping our firm to grow to three states, involving herself in 15 different insurance organizations and serving on many of the boards. We will deeply miss her bright and shining personality, but we know she will move on to accomplish great things as a Realtor with Southern Home Professionals! Congratulations!